Divide in Excel (Formula, Examples) | How To Use Excel Divide? 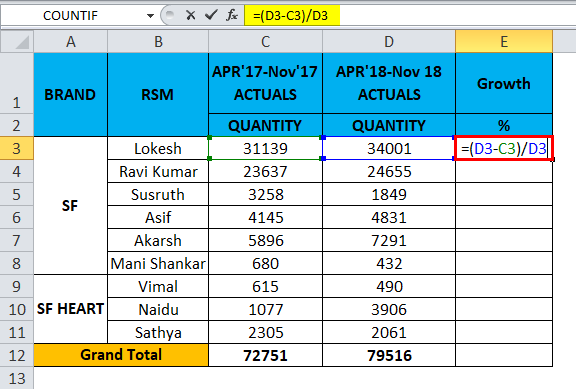 How to Use Divide Formula in Excel? In excel we can see that arithmetical operation has been used in various reports like inventory, monthly sales, salary, wages, etc… to calculate a simple addition, multiplication, division. The word division means the operation which is the opposite of multiplication where the symbol of division can be a forward slash, or a line or a division sign and this is also called a fraction. Each division equation has a name which we normally call as a dividend, the divisor, and the quotient. These arithmetical operators work simply as calculator where in excel we need to use “equal” = sign in each cell to get the output. The number which is divided is called the dividend and the same number which the dividend is divided by is called the divisor The output is normally called a quotient. 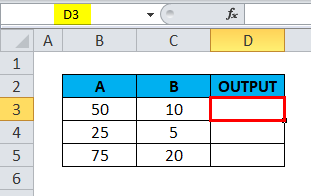 Division in Excel used in the same manner by using the “equal” sign in each cell to get the quotient as the output. Division operator can be used in excel by using the arithmetic operator slash (/) forward slash. For example, click on the cell A2 with the mouse pointer and enter = sign and type the division sign (/) forward slash as =B2/C2 and press the enter key, where b is the dividend and c is the divisor which will give you the desired output. For example, if you type =20/5 excel will give the output as 4. 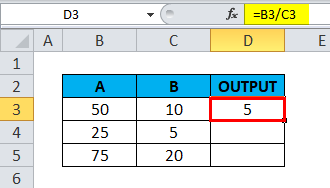 Make sure that you have to use equal (=) sign in each cell to get the output. Otherwise, Excel will interpret and gives the output as a date. Nested Division operator can also be used to find out the exact result in excel. How to divide two columns in excel? In this example, we will see step by step how the division (/) forward slash operator works in excel with the following below steps. Consider the below example which has two columns A and B with specific numbers. We will use the / forward slash operator to find the output. Click on the cell D3 column. Enter the formula by using the / forward slash operator. Enter =B3/C3 as shown below. We will get the output as 5. Drag the formula for the entire corresponding cell so that we will get the output as follows. 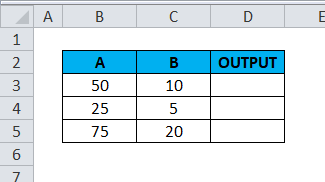 How to use division (/) operator with other Subtraction operators (-) in Excel? In this example, we are going to see how to do multiple divisions step by step. Assume that we have multiple columns where we need to find out the Growth percentage of the sales. In this scenario, we can use nested division to fetch the exact output. Consider the below example, we can see that month wise quantity break up has been given for sales and we have to calculate the growth percentage using the division operator. We will see step by step how we got the growth percentage for individual salespersons. Click on the column Growth. Enter = equal sign in E3. Update the formula as =(D3-C3)/D3. We will get the output as 8%. Drag the formula for all the cells from top to bottom and we will get the below result as follows. The above sales result shows the growth of salespersons for the specific month. In this way, we can use them. How to Use Nested Parenthesis in Division Operator Using Addition (+)? In this example, we are going to see how to use nested division by the following below steps as follows. Consider the below example which shows sales data month wise plus we have predicted future sales figure for Jan-19. Now we are going to see how to use nested parenthesis in the division operator by following the below steps. Create a new column name Output. Click on the cell F2. Enter open parenthesis as shown below =(C2+D2)/E2. In this example, we have used opening and closing parenthesis by using both addition and division operator. 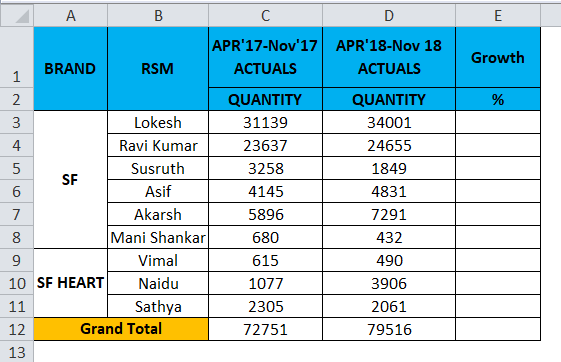 We have added Nov-18 and Dec-18 month and divided the value with Jan-19 month to get the output. Convert the value to % as shown below. Drag the formula for all the cells. Hence we will get the result as shown below. In this example, we will see how to find out the average of the student’s marks by using the division operator. Let’s consider the below example where students scored marks for maths and science subject, here we need to find out the average of student scored for both. In this case, we can use the division operator to find out the average by following the below steps. In order to calculate the average, a basic formula is Total number of marks scored / Number of students. Create a new column as average. Enter the open parenthesis bracket as shown =(C2+E2)/2. We have added maths subject plus science subject divided by total subject. We will get the output as 84. Drag the formula for all the cells so that we will get the average of all students as the output shown below. In this example, we will see how to use division operation with IFERROR condition to avoid #DIV/0! Error. 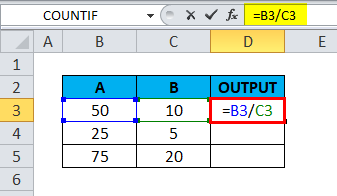 Mostly excel will throw an error if a cell has blank value while using the division operator as shown below. In order to avoid this error, we will use “IFERROR” condition so that we can overcome with these errors. Click on the cell name Result. Enter the IFERROR formula as shown below. We will get the output as 4. 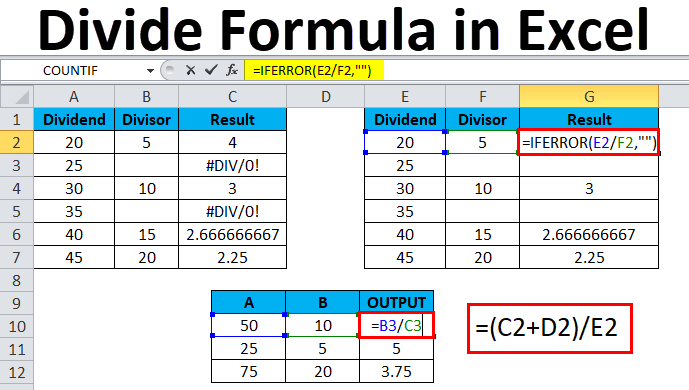 =IFERROR(E2/F2,””) – which indicates we have used dividend number 20 /divisor number 5 which will give us the output of 5 and at last we have closed the quotation marks to avoid DIV error. Drag the formula for all the cells. We will get the below output as follows. 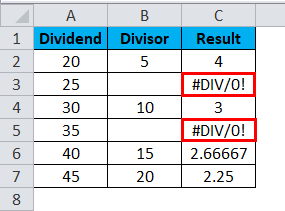 When using Division operator make sure that all cells have exact values. If the cell values are blank excel will throw an #DIV Error.